The measurement and control of heat related to fluid processing is a vital industrial function, and relies on regulating the heat content of a fluid to achieve a desired temperature and outcome. The manipulation of a substance's heat content is based on the central principle of specific heat, which is a measure of heat energy content per unit of mass. Heat is a quantified expression of a systems internal energy. Though heat is not considered a fluid, it behaves, and can be manipulated, in some similar respects. Heat flows from points of higher temperature to those of lower temperature, just as a fluid will flow from a point of higher pressure to one of lower pressure. A heat exchanger provides an example of how the temperature of two fluids can be manipulated to regulate the flow or transfer of heat. Despite the design differences in heat exchanger types, the basic rules and objectives are the same. Heat energy from one fluid is passed to another across a barrier that prevents contact and mixing of the two fluids. By regulating temperature and flow of one stream, an operator can exert control over the heat content, or temperature, of another. These flows can either be gases or liquids. 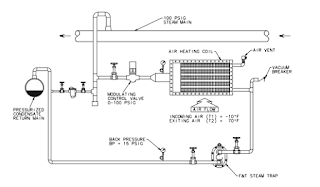 Heat exchangers raise or lower the temperature of these streams by transferring heat between them. Recognizing the heat content of a fluid as a representation of energy helps with understanding how the moderation of energy content can be vital to process control. Controlling temperature in a process can also provide control of reactions among process components, or physical properties of fluids that can lead to desired or improved outcomes. Heat can be added to a system in a number of familiar ways. 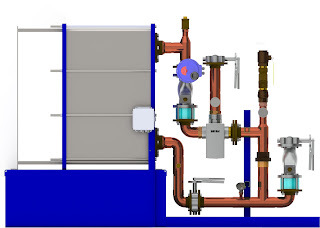 Heat exchangers enable the use of steam, gas, hot water, oil, and other fluids to deliver heat energy. Other methods may employ direct contact between a heated object (such as an electric heating element) or medium and the process fluid. While these means sound different, they all achieve heat transfer by applying at least one of three core transfer mechanisms: conduction, convection, and radiation. Conduction involves the transfer of heat energy through physical contact among materials. Shell and tube heat exchangers rely on the conduction of heat by the tube walls to transfer energy between the fluid inside the tube and the fluid contained within the shell. Convection relates to heat transfer due to the movement of fluids, the mixing of fluids with differing temperature. Radiant heat transfer relies on electromagnetic waves and does not require a transfer medium, such as air or liquid. These central explanations are the foundation for the various processes used to regulate systems in industrial control environments. 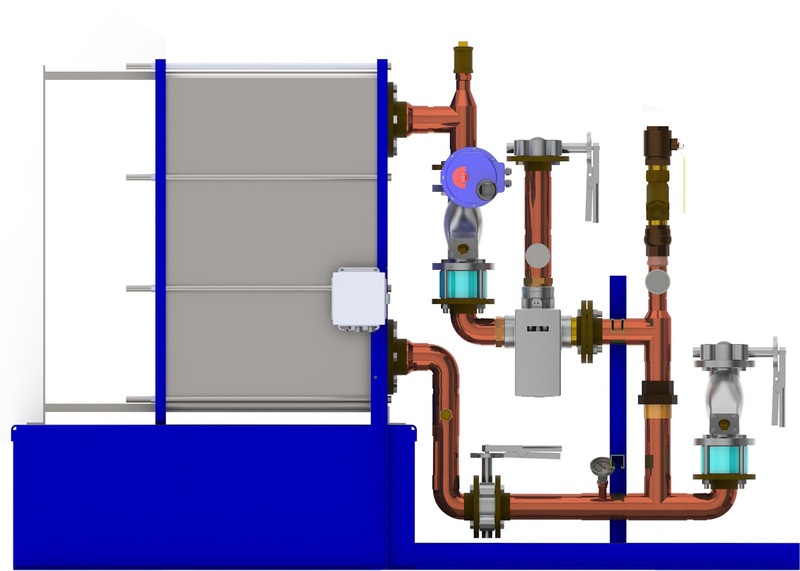 The manner in which heat is to be applied or removed is an important consideration in the design of a process system. The ability to control temperature and rate at which heat is transferred in a process depends in large part on the methods, materials, and media used to accomplish the task. Stall can most easily be defined as a condition in which heat transfer equipment is unable to drain condensate and becomes flooded due to insufficient system pressure. Stall occurs primarily in heat transfer equipment where the steam pressure is modulated to obtain a desired output (i.e. product temperature). The pressure range of any such equipment ( coils, shell & tube, etc....) can be segmented into two (2) distinct operational modes, Operating and Stall. Operating: In the upper section of the pressure range the operating pressure (OP) of the equipment is greater than the back pressure (BP) present at the discharge of the steam trap. Therefore a positive pressure differential across the trap exists allowing for condensate to flow from the equipment to the condensate return line. Stall: In the lower section of the pressure range the operating pressure (OP) of the equipment is less than or equal to the back pressure (BP) present at the discharge of the steam trap. Therefore a negative or no pressure differential exists, this does not allow condensate to be discharged to the return line and the condensate begins to collect and flood the equipment. You can read the entire Armstrong technical paper below. Visit this link to download your own copy of Armstrong Fluid Handling: Understanding and Solving Equipment Stall. Understanding & Solving Heat Transfer Equipment Stall from Mead O'Brien, Inc. Here are some basic steam terms associated with the Steam Table (left). Below is a slideshow of basic heat transfer concepts. Saturated steam is pure steam at the temperature that corresponds to the boiling temperature of water at the existing pressure. Absolute pressure is pressure in pounds per square inch (psia) above a perfect vacuum. Gauge pressure is pressure in pounds per square inch above atmospheric pressure, which is 14.7 pounds per square inch absolute. 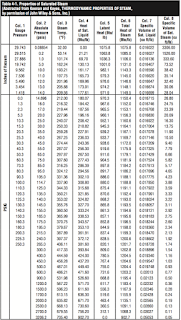 Gauge pressure (psig) plus 14.7 equals absolute pressure. Or, absolute pressure minus 14.7 equals gauge pressure. For every pressure of pure steam there is a corresponding temperature. Example: The temperature of 250 psig pure steam is always 406°F. This is the amount of heat required to raise the temperature of a pound of water from 32°F to the boiling point at the pressure and temperature shown. It is expressed in British thermal units (Btu). The amount of heat (expressed in BTU) required to change a pound of boiling water to a pound of steam. This same amount of heat is released when a pound of steam is condensed back into a pound of water. 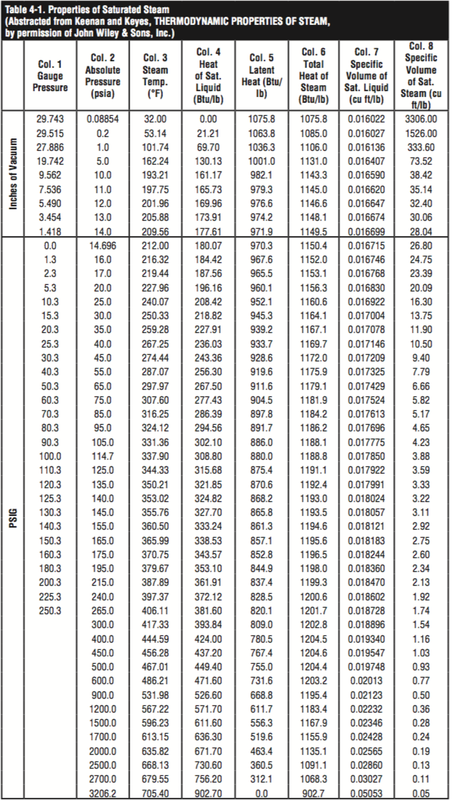 This heat quantity is different for every pressure/temperature combination. The sum of the Heat of the Liquid and Latent Heat in Btu. It is the total heat in steam above 32°F. Specific Volume of Liquid. The volume per unit of mass in cubic feet per pound. The volume per unit of mass in cubic feet per pound. Basic Heat Transfer Concepts from Mead O'Brien, Inc.